I was about as full of anticipation as the gas tank in my wagon. Loaded up and ready to go chase the thunder chickens of South Dakota. The center lines on the highway just wouldn't go by fast enough. There is not many places where you can hunt an area with three different species of birds and the area I was heading did. A giant valley with scattered timber welcomed me when arriving to my destination. New landscapes are one of the most exciting parts of a new adventure. Time to scout, scout, then maybe a little scouting. Taking in all the views my eyes were in strutter mode. Nothing gets your heart pounding like spotting a big old strutter out in the field. Feathers flexed and wings dropped. Dancing and spinning as to make sure all the lady hens see who the man is. Figuring on strutting grounds and roosting locations a plan is a brewing. Tired out of my mind from the journey, darkness crept in. I'll tell you what, it's not easy sleeping with your eyes wide open. I felt like the best behaved child of all year awaiting Christmas morning. I guess, for me, it was. Next thing I know I'm setting up my decoys and hunckering down wondering if the timber is going to explode with gobbles. First things first. Medow Larks and every other song bird called out like a rooster in the farm yard. The timber was coming to life. Hens started yelping in the hollow behind me. Right on que, old long beard had enough. Gobbles sounded off and the hair on my neck would have been standing on end if I wasn't wearing a facemask! The sound of air ripping through feathers filled the timber as the large birds left thier roost and put thier feet on the ground. I heard every sound a turkey makes that morning. From spit and drumming to purring. It was amazing except the part that all this was going on too far away. That was pretty much the case for this spot, which we named dead cow, for the rest of the morning. I gathered my gear, and myself, and headed on to the next. I had some particular birds in mind that were frequenting a large wrap around wind row. Upon arriving to the new location the fields were empty of turkeys. 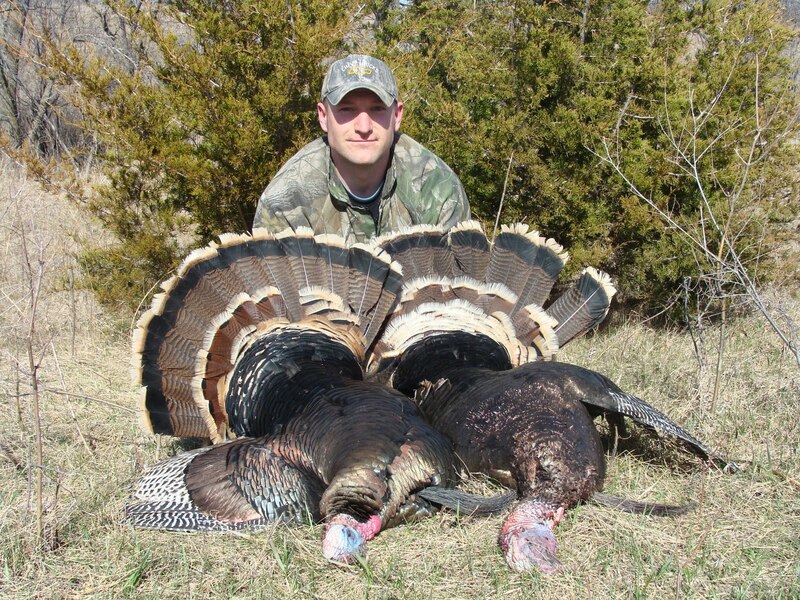 Turning the wagon around with disappointment and the next thing to be seen is three gobble crazy struttin' toms! Back in action. They strutted and goggled right past me, crossed the highway, and headed towards the wind row. Can you say hurry? Should be a piece of cake. Nope. We played the most wonderful game of cat and mouse a man and a turkey has ever played. It felt like we were the pieces on a checker board and the wind row was the board. Finally, the toms had hung up in a very thin strip of trees. Inching closer and closer without much of a responce. I was throwing everything at these boys with my mouth call. Just when you think its a done deal they commit. And commit they did! Taking turns going in and out of strut the gobblers closed the distance and I closed the book! Boom! Big tommy down! King me! My first Merriam trukey. This was a classic hunter and tommy encounter. Changing positions serveral times and a long call off. You have to love it! Little did I know what was in store for me. A short time later down in a hollow it would happen to me again, but this time the tom was a Rio Grande turkey. Again, my first Rio. Two species down in one morning. What an unforgetable experience! The views, the great people, and the turkeys. Amazing. Best of all, I did it. I went through the motions and I made it happen. There is no better motivation that accomplishing a dream and soaking everthing up along the way. A lot can happen in a South Dakota morning.